I thought it might be good to showcase some of the work I do for my clients from start to finish, showing you how I pull it all together and how my process works. 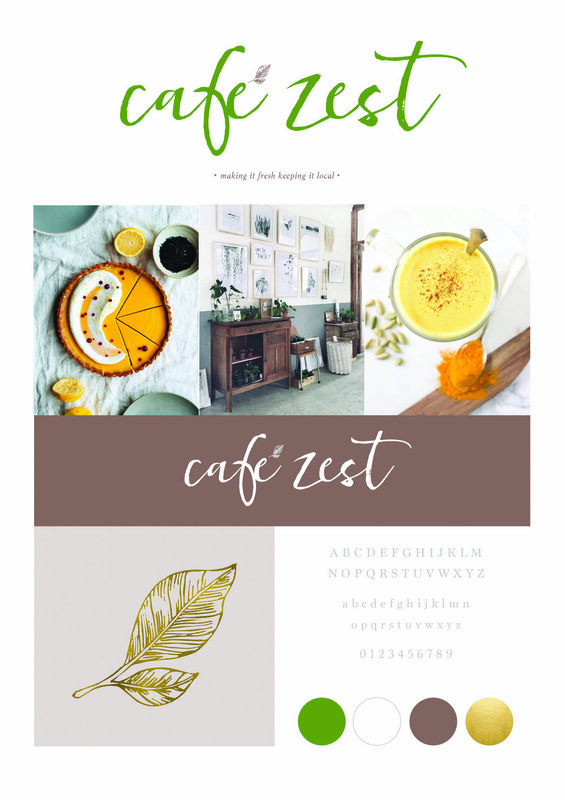 I have decided to do my first showcase on 'Cafe Zest', this is a beautiful cafe situated in Palmerston North, on Ruahine Street across from the hospital. When I worked for MidCentral District Health Board as part of the Communications team focusing on design, this was the cafe to go for coffee and a bite to eat. When Kendall contacted me about helping them establish a brand I was so excited to meet up with Kendall and Alex and be apart of this journey with them. With all my clients our first initial catch up is based on listening to your goals, dreams, and vision for what you are wanting to achieve for your company. I do a lot of listening and understanding at this initial catch up because it is important for me to understand your vision so then I can translate it into visual elements and help you build on that story. I leave my clients with a questionnaire brief to fill out and to return to me when they have done this process whether its emailed or we catch up in person, my door is always open to answer questions and most often than not there are always more questions. It is a big process and I want this to be an exciting journey for you. It's from this brief that takes me on the research part of my process. I research into your competitors as I need to understand that what I create for your brand is going to stand out above and beyond whats already out there. I research into your target market because I need to understand that whatever I create for you has to capture your target markets interests. I have blogged about the importance of knowing your target market and making sure its refined as much as possible you can read about that here. Once all that information is collected I then work on translating this information, it's from here that I can start to help you build your brand or if you're refreshing your brand it helps me move in the direction you are wanting to go in. I create a mood board that will represent the feel and emotions that you want to be evoked in your target market. This is such a vital step in our process together because this helps to make sure that I have understood my clients and their vision. Getting this right saves a lot of time later on and time saves money. You can read my blog about mood boards here. Throughout your process, with me, we reflect a lot back to this mood board. It helps us stay on track throughout our journey together. Individual images taken from Pintrest. From here the fun part begins this is where I create. I take all that information and I can now create something that will represent your brand. I research into different font styles that will evoke the emotions from the mood board. I work on different layouts and elements, I work on changing the font style to represent the mood board, once I have the best three I provide my clients with the best three concepts that represent the mood board. These are the three concepts that I represented to 'Cafe Zest'. These are as raw as they come, no colour is added at this stage because if a logo does not look great in black and white it will not look any better in colour. I always tell my clients to not make a decision overnight. One will usually stand out straight away but I recommend that you print them out and have them somewhere where you can view them i.e on the fridge. Because I can almost guarantee that the one you first initially liked won't be the one you end up going with. This is a really important decision, one not to be rushed. Once you have made that decision we work on the one that was chosen by refining it some more, this could mean taking elements from one of the other concepts and adding it in to the one that the client choose. Last of all we add colour. This part is really important too because the colours you use have to represent your company, your choices, your environment and most importantly they have to attract your target market. For Cafe Zest, they already had their colour pallet established by setting up the environment of the cafe. It was taking that environment into account and building that brand around that and all the information that we had researched. Cafe Zest created an environment that was warm and inviting, fresh and true to their beliefs of keeping it local. Their produce is resourced from local supliers and the importance of making sure that their food is as fresh as it comes. We looked at elements that could be used such as the lemon leaf, we decided on this not only because the word 'Zest' represents a beautiful citrus fruit but because the word 'Zest' also means great enthusiasm and energy. This was exactly the vibe Kendall and Alex wanted to create along with warmth, fresh, local. 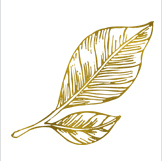 With the option for print to have the leave printed in gold foil. We refined the colour pallet and came up with the below colour pallet. From their, it was the colour concept stage to see which was going to work best to represent their brand. The finished product from that process was this. It represents everything they stand for. It tells a story of their journey. It encapsulates their beliefs, their environment and emphasizes the language they use and most importantly it attracts their target market. If your thinking of refreshing your brand or your a new startup company I would love to hear from you. Let me understand, translate and create your journey. You can view more of the work for cafe zest here, this is truly where you can see their story come to life. I highly recommend you pop into Cafe Zest for a coffee and a bite to eat to.